James explained to Ron how members of his family kept seeing what looked like a fire off in the distance from their residence- at a site on their property. But, he explained that whenever they would see this fire and go to examine it, they would find nothing when they got there. No charred wood- nothing. He was insistent that Ron come and see it, but Ron felt it was just a “side-track”- a way for James to get Ron to go with him and perhaps stop off at a family member’s shop, where he would be offered a 10% discount. Ron and his sons were working on the Ark of the Covenant site and he didn’t want to waste any precious time, so he did the only thing he knew to do- he prayed about it. If it rained and he wasn’t able to work the next day, yes, he would go with James. And the next day it rained. Ron never depends on his own wisdom in these matters but asks for a direct sign of God’s will as to what to do. Surprisingly, James led him right to his family home with no stops. The family is very large – many brothers – and they all lived in the area, some at home with their mother, and some had their own homes. He took Ron to the site and Ron saw nothing. Nothing, that is, except limestone swelling up from beneath the surface of the earth like a giant balloon buried under them. The family was serious about their story – they were a bit frightened about the lights they had seen there. And Ron was puzzled – he couldn’t do anything to help them. But he knew the circumstances that had led him here were not of the ordinary sort. And from the beginning, Ron suspected that this was probably the site of the real cave of Machpelah – the burial site of Abraham, Isaac, Jacob and their wives. But for the next fourteen years, he never saw the site again. In 1982, James worked with Ron in the cave system in Jerusalem after both of Ron’s sons had gotten sick and had to go home. Being quite small and slim, James was able to easily enter the small areas in the cave system and tell Ron if anything was there. In January, he entered a darkened chamber that Ron thought just another dead end. As James crawled in, Ron was about to hand him the flashlight when suddenly James came scurrying out of the small hole: “What’s in there?! What’s in there?! I’m not going back in there! !” He was terrified – completely. And he never worked in the cave again. But if he hadn’t come scurrying out of that hole like he had seen the devil himself, Ron would have never paid it a bit more thought. He never would have enlarged the hole and crawled in himself on January 6, 1982 at 2:00 in the afternoon- he never would have found the Ark of the Covenant if it hadn’t been for James’ reaction of complete and total terror. James went back to work in the restaurant where Ron had met him. But in the mid 1980s, James had the misfortune of visiting in Jordan at the wrong time. Ron later learned that he happened to be there at a point in time when a mandate was passed that all Arabs out of the country of Israel at that time could not return. And to this day, Ron has never seen James again, although he has spoken with him numerous times by telephone. In late 1992, another fortuitous event occurred. Ron ran into some people he had known back during that time who also knew James and his family. Ron asked them if they knew about James’ family – if they were still there, etc. The memory of the events in Hebron never left Ron’s mind. Amazingly, Ron ended up visiting the family in Hebron that very trip. And even more amazingly, the family remembered him and were very happy to see him. But things had changed over the years. The brothers had all married and built homes in the area. Other relatives had homes behind them – the site Ron examined years ago was surrounded by homes, all within “spitting distance”. When he had been there in 1979, the area was basically a vineyard. The way things had worked out, Ron figured it was time to see what was really here.So, he sat down with the family – some members of the family speak very good English, and they translated for the rest of the family. He carefully explained his research and why the traditional site cannot be the actual site. Interestingly, they told Ron that they believed the traditional site wasn’t authentic. They were interested in finding out what was on their property and told Ron they would arrange to enter the cave by excavating it themselves. Ron needed to survey the site with his electronic equipment to locate the chamber before they began to dig, and as he was working on another project and only had a short time to visit, he told them he would be back soon. So they bid him farewell and said they looked forward to seeing him again. In April of 1993, Ron returned to Israel. I went with him, as did Lloyd Hiler, a surgeon from Memphis, Tennessee. Leaving Lloyd and I in Jerusalem, Ron went alone for the initial visit, then came and told us to get our bags – we were going to stay at the site. Now, Hebron is an area of a great deal of tension. An American woman would be very conspicuous, so I had to stay out of sight most of the daytime hours. Even Lloyd and Ron had to be careful about being seen. We stayed indoors the rest of the day. That night, under the full moon, we all went to the site in the midst of all the homes. It was a garden area and the brothers had planted fruit trees and all sorts of herbs in the area, so we had to watch carefully where we walked. We stood up on that high plain and looked out where we could see Tel Aviv off in the distance. The brothers told us how they were able to see the scud missiles fall there during the Gulf war. But as we chit-chatted, Ron was nonchalantly doing electronic scanning of the site. After about 1 1/2 hours, we went back in the house we were to stay in. Ron, Lloyd and I all camped in one room – Ron and I on a mattress on the floor and Lloyd on a couch. In the next room was one of the wives and the daughter of a brother who had 2 wives. He told us he would stay with his other wife that night, who lived in a house just about 20 feet away. I had a hard time with that situation – I liked both wives equally and I couldn’t imagine living in such a situation. But I must say, they seemed quite happy, although I never saw the two wives together. Finally morning came and we all awoke, anxious and a bit nervous. The brothers had been busy even before we awoke. A plan had been formulated the night before. The family would dig underground into the site – their “cover story” for curious onlookers would be that they were digging a well. They did not want other prying eyes to know what they were really doing. This meant that Ron couldn’t participate in the actual excavation, at least not for the time being. Before we awoke, one brother had arranged for a backhoe to come that very day and begin the dig! I couldn’t believe it – there is no way we could get a backhoe here in our country on such short notice! But by about 1:00 that afternoon, it was digging the hole. I was so amazed at this – to us it seemed that the Lord was working one miracle after another. We were praying constantly that the Lord’s Will would be done and for Him to let us know what to do. After all, the only reason Ron believed this site contained the Cave of Machpelah was because of the strange events which led to his coming to the site. I managed to video the backhoe through the window, since I couldn’t go outside. When all was said and done, I wanted as much documentation of the events as I could get. We were trying not to act excited and at the same time, I admit to being a bit nervous. After all, no one knew where we were if anything happened to us. We were not exactly on friendly turf- Hebron is a dangerous area for tourists of any kind, but especially Americans. But the family was very gracious to us and I felt very safe with them. We had to rent an Israeli rental car for driving in Israeli territory and then we had to rent one from a Jordanian rental company to drive in Arab sectors. And we also had to place a certain item on the front dash which we were told would be a signal not to throw rocks at us. We’re not sure what it all meant, but we did it and it worked. I never got to go back to the site in the back yard again that trip, even though it was only about 100 steps from the house. Work had begun and I had to stay out of sight. Ron and Lloyd would each go back there at times, but they didn’t dare takes cameras. The trick was going to be in avoiding attention of the neighboring family members. We all knew that the motivation of the family was more than just finding Abraham’s burial site – they sensed that this could be something that could bring good fortune to the family. And that was fine with us. After all, it is their land. Finally, we decided to come back home. If we changed our airline tickets, it would cost a lot extra. The initial work of digging would be slow and we could do nothing to help. The entire family was extremely gracious to us all and we grew to love the children, especially the little four year-old girl who lived in the house we were staying in. She had been so shy with us the first day. But the second day, when I began to talk “bird talk” to her little pet finches like she did, she warmed right up. She recited both the Arabic and the English alphabet and tried desperately to teach me the Arabic alphabet. I was a total failure- she would repeat the Arabic letters to me, pressing my cheeks together with her little hands exactly like I’m sure her teacher did to her when she was learning her pronunciation. When I would say it all wrong, she and her mother would just giggle and then – so as not to make me feel embarrassed – they would repeat it over and over again for me. I videotaped this entire scenario and I will never forget how stupid I felt. This little four year-old knew my alphabet by heart, but I couldn’t even say hers. And to think, we have children in this country who can’t even read when they graduate. It had been decided before we left that when the brothers entered the cave, they would call us. If not, Ron would return in June. When no word came, he arranged his tickets for late June. And just after he arranged for them, the call came: “Hello, Mr. Ron- when are you coming?” Ron replied “About June 22nd”. The only reply was “Welcome!” The oldest brother, and spokesman for the family, did well – Ron had asked him not to discuss the project over phone lines and he didn’t. And we were excited! We called Lloyd and “yes”, he wanted to go. But there was one problem – Ron would be alone in Hebron the first few days as Lloyd’s surgery schedule wouldn’t allow him to come until the 28th. Ron and I didn’t discuss it much, but I was praying for someone to go with him. And nine days before he was to leave, we had a young couple visit our home, Marty and Julie. Marty had told us several months ago that he wanted to go to Turkey and help work on Noah’s Ark if the chance ever came up and Ron needed him, but as he and his wife are expecting their first child in August, we didn’t even mention this trip to him. But he asked the magic question – “Do you have any trips planned in the near future and do you need any help?” To make a long story short, in nine days, Marty got his passport and ticket and went along. I was so very thankful that the Lord had arranged for Marty to go – not only would Ron not be alone in Hebron, but Marty’s profession is drilling into the earth and checking underground structures- the very method Ron was expecting to employ on this cave with fiber-optic type cameras. When they arrived in Hebron, Marty later told us, the atmosphere was tense. The family didn’t react too well to a stranger in the midst. They had gotten to know Ron, Lloyd and I, and for a short while, Marty said, the brothers acted very suspicious. But Marty very quickly won their confidence and the brothers proudly showed them the work they had been doing – they showed them the cave. The excitement at entering the cave was offset for Ron and Marty by the sudden realization that the work was just beginning. The cave had been damaged by an earthquake and lots of dirt was in the bottom. Ron had them dig one place to see how far down the floor of the cave was – it was about 5 1/2 feet. But most disappointing was the fact that there were no bones there. In fact, there was nothing except broken pieces of a very large flattish bowl which dates from the time of Abraham. But, there were what appeared to be three giant-sized crypts and a smaller, shelf-like section carved into one wall which was a little above waist level. There were holes in the walls around the cave entrance which clearly looked like attachments for some type of door. There were holes which were set in the wall at an angle, which appeared to be for torches to be set in the wall. But of equal interest was the ancient building above the cave. Ron had seen this structure years earlier but since he didn’t know exactly where the cave was, he didn’t associate the building with the cave. But once inside the cave, they found what looked to be a “vent” hole in the ceiling of the cave, and discovered that the building was built directly over this hole. While the “vent” hole is now plugged with rocks, it may be that initially the building was built to cover this open vent and prevent rain, snow and debris from falling into the tomb. At the same time, the building’s design indicates that it was erected as a type of monument, as it is about the same size as the cave. In a few days, Lloyd arrived and all three men carefully documented the evidence. They videotaped and photographed. They measured everything. Samples of the material from the floor of the cave and each crypt were taken, which will be examined in laboratories for evidences. And then, Ron, Marty and Lloyd headed home. The work is not near finished. The brothers are, as I write this, sifting through the soil and debris in the floor of the cave, searching for anything that will give evidence. Now, we will share with you the evidence at the site, and hopefully by the next newsletter, we will have the evidence we believe is there. As we all reviewed the video tapes and photographs, we realize we are in the same situation we were at in 1990 with Sodom and Gomorrah – we believed without a doubt that those were the ashen remains of the cities of the plain. But we didn’t have the definitive evidence until we found the sulfur capsules throughout the ash. Today, we really believe this site to be the cave of Machpelah – the evidence has revealed nothing which would negate that conclusion. And we won’t stop work until we find the evidence we believe is there, or until the Lord intervenes. The first consideration must be location – the site we are working on is in the suburbs of present day Hebron. Hebron is situated in a valley which runs north/south, surrounded by beautiful, terraced hills. The cave is situated on a plain atop one of the many, many hills. GEN 13:18Then Abram removed his tent, and came and dwelt in the plain of Mamre, which is in Hebron, and built there an altar unto the LORD. The site of the cave is on a plain, near its edge, at the top of a high hill. Just a few hundred feet from it, the hill begins its descent and goes straight down. It is breathtaking to look out from the site in the direction of the fertile, green valley. GEN 19:27-28 And Abraham gat up early in the morning to the place where he stood before the LORD: And he looked toward Sodom and Gomorrah, and toward all the land of the plain, and beheld, and, lo, the smoke of the country went up as the smoke of a furnace. When you are in the valley below this site, you can’t see anything off in the distance except the surrounding hills. To be able to see what is described in this verse, Abraham would have needed to be high up, not in the valley. Again, our site meets this criteria. Who was buried in the cave? GEN 50:2 And Joseph commanded his servants the physicians to embalm his father: and the physicians embalmed Israel. 12 And his sons did unto him according as he commanded them: 13 For his sons carried him into the land of Canaan, and buried him in the cave of the field of Machpelah, which Abraham bought with the field for a possession of a burying place of Ephron the Hittite, before Mamre. Our greatest hope was to find an Egyptian mummy in the cave. But they didn’t find one. Several possibilities come to mind as to why no bones or mummy was found: there is always the distinct possibility that the remains of the deceased have completely decayed away – the cave was not airtight although it appears to have been sealed tightly enough to keep out wild animals. It may be that evidence will be found of linen wrap such as was used in mummification in the debris from the cave, as well as decayed bones. 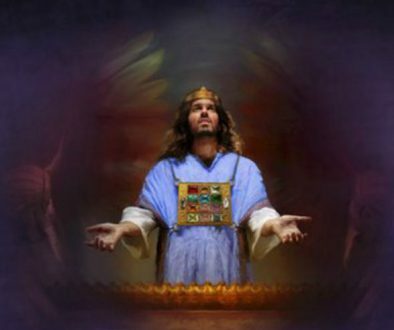 Or, there is another possibility, which we will discuss in the article – “The Ark and the Cave – What’s the Connection?” There is a great deal of dirt which still has to be sifted through, so the conclusion on this subject is not yet known for sure. But I will state that we really didn’t expect to find the bones. You’ll understand why when you read the later article. Jewish Burials- Machpelah a “Prototype? We studied carefully everything the Bible tells us about the burials of the followers of the true God. Abraham was the “father” so to speak, of the Jewish nation and his tomb would be the prototype for future Jewish burials. What we learned was that the Jews placed a great deal of importance on preserving the actual bones in the burial. We know of their later practices- how they buried all members of a family in one area: as each person died, their body was interred in a family sepulchre. When the rest of the body was completely decayed away, they placed the bones in an ossuary, a box or chamber for the family bones. This way, many, many generations could be buried in one family tomb. 1) Burial with ancestors was important if it was possible – Gen.47:30; Jdg.16:31; 2Sam.2:32, 17:23, 19:37. 1) The eyes of the deceased were closed at death- Gen.46:4. 2) Spices were used in preparing the body – 2Ch.16:14. 3) The deceased was carried to the grave in sight of the people – 1Kin.13:29,30; 2Kin.23:30. 4) Monuments were erected over the burial site- 2Kin.23:17. 5) The deceased was placed directly in contact with the bones of the previously buried inhabitants – 2Kin.13:21. We have provided only a few scriptures. If you wish to study the subject further, look up the words “bones”, “sepulchers”, “bury and buried”, etc. It is important to rule out the possibility of this being a heathen burial because Hebron was inhabited by the heathens during the time of Abraham. In fact, it was the inhabitants of Hebron that scared the twelve spies whom Moses sent out to scout the Promised Land. With such a history of heathens in the area, a heathen burial must be ruled out. If this cave was a heathen tomb, it would reflect their burial practices. Almost everyone is familiar with the ancient practices of placing objects in the tombs of the dead – this practice is based on their belief in the after-life. The objects range from small trinkets, to jewelry, to real food for the dead to presumably consume. In fact, it is through studying the objects in ancient heathen tombs that archaeologists get most of their information on ancient people and their customs. But there would be none of this if this was a burial of a believer in God. In this case, what is not present in the cave is as important as what is in it. And again, our site passed the test. The large, broken bowl was all that was found. It dates to the early Bronze Age- the time of Abraham. Its size and shape – very broad and very shallow- indicate that it may have been used in preparing the spices for the burial or held water for washing the body. Many graves have been found in Hebron which contain a great deal of funerary items that show them to have been heathen burials. And the vast majority of these graves do still have the bones in them. 1) The cave is in the correct location – in Hebron, at the edge of a plain atop a very high hill. 2) There are no artifacts in the cave except for the bowl we discussed above. 3) There is a shelf-like niche carved into a wall of the cave, which could have acted as a table on which to prepare the spices for the burial. This shelf is 1.43 meters longs and .78 meters wide. The area above the “table-top” is also chiselled out which indicates that it was used as some type of work area. 4) There are holes carved into the upper portion of the walls of the cave which are angled downward- they are consistent with holes made to hold torches (burning pine knots). 3.75 meters long by 1.33 meters wide. The size of each crypt can be seen to be relatively uniform. The fact that there are just 3 and not 6 could indicate that the wife of each patriarch was buried in the same crypt as her husband. 6) There was a doorway to the cave as its outline can be seen chiselled into the entrance. The rock sealing the doorway seems to be missing, although it could be under the debris in the cave floor. However, the outline which was chiselled for the door can still be easily seen, as well as the matching holes on each side of the doorway, which would have secured the door. 7) There is an ancient structure directly on top of the cave. 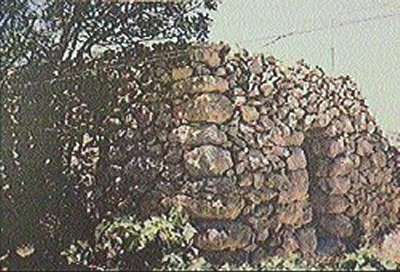 This structure, what is left of it, indicates that it was some type of shrine. It has a sort of fenced enclosure on one side, just below the terrace upon which the building sits, and this enclosed area surrounds the entrance to the cave, just beneath the little building. There is also remains of an object in the midst of the area which resembles an oblong altar made of stones. 8) There is an entrance-way into the cave from inside of this building, but as it lets out straight down into the cave, its purpose cannot be exactly understood. It may be where the cave was fractured by an earthquake, as many large stones are plugging this entrance. 9) Inside the cave, there is a wall section plugged with rocks which appears to be an entrance into another chamber. There is a strong tradition among the Jews that the cave of Machpelah was a “double chambered” cave. When Ron threw down the rock on the site in 1979 and heard the reverberation under his feet, it indicated a large chamber under him. This area was adjacent to the building or monument which is erected just over the chamber they entered, and thus indicates the presence of another cave or chamber in the direct vicinity. The family which owns this land has built on most of the land, or farmed it. As a result, they have dug on most of the surrounding land directly adjacent to the cave. They showed Ron, Marty and Lloyd numerous burials they had dug up in the course of cultivating their land. These were very deep and when they found these graves, they placed the bones in plastic bags and reburied them where they found them. One brother told Ron they had found 51 burials directly around the cave – and he said that they found nothing in the graves but bones. This is a strong indication that the deceased were worshippers of God because of the lack of funeral items. “At length, his [Joseph’s] brethren died, after they had lived happily in Egypt. Now the posterity and sons of these men, after some time, carried their bones and buried them at Hebron;…” Antiq. of the Jews, Book II, chapter VIII, para. 2. Joseph’s “brethren”, the sons of Israel, are here said to have been buried at Hebron. If we remember that even Abraham wasn’t living here at the time of his death or Sarah’s, we can know that the only land in Hebron they could have been buried on was the land Abraham had purchased – the field with the cave. We also know that Abraham had many servants who would have wanted to be buried along with him and so perhaps these are their burials. We can be sure that anyone who was of his household would have been a believer in the true God, simply because Abraham knew of God’s command to stay separated from the heathen. “My father made me swear, saying, Lo, I die: in my grave which I have digged for me in the land of Canaan, there shalt thou bury me. Now therefore let me go up, I pray thee, and bury my father, and I will come again.” Genesis 50:5 The Hebrew word for “grave” (qeber) and “digged” (karah) are literal here- Joseph is saying that his father, Jacob literally dug his own sepulchre. The three separate sepulchers are each hand-hewn, as the chisel marks are still visible. “Isaac also died not long after the coming of his son, and was buried by his sons, with his wife, in Hebron, where they had a monument belonging to them from their forefathers.” Antiq. of the Jews, Bk. II, chapter XXII, para. 1. “In the cave that is in the field of Machpelah, which is before Mamre, in the land of Canaan, which Abraham bought with the field of Ephron the Hittite for a possession of a buryingplace. There hey buried Abraham and Sarah his wife; there they buried Isaac and Rebekah his wife; and there I buried Leah.” Genesis 49:30,31 As we mentioned, there is an opening from the building into the cave, which has been sealed by very ancient stones. There is evidence that the cave was fractured by an earthquake at some unknown point in time. There are other numerous places where rocks have been inserted in the cracked areas to seal it back up, so we don’t fully understand the hole from inside the building into the cave yet. Thus far, it is consistent to have an altar at a place that was sacred to Abraham, and it wouldn’t be taking too much liberty to expect that Abraham would certainly consider the final resting place of his wife, himself and his descendants to be worthy of an altar to the Lord. 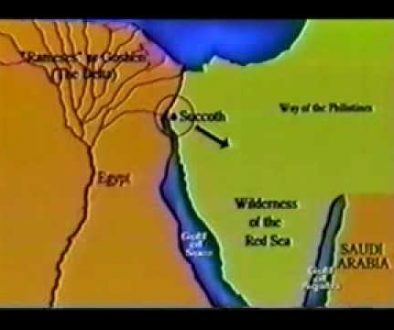 So here is one more evidence which points to this cave as the true cave of Machpelah. “The only indisputable fact in all this is that the cave at Hebron cannot possibly be the Biblical Cave of Machpelah; it is in fact a man-made water-cistern, once carefully plastered to prevent the water seeping into the rock.” Archaeology of the Bible, by Magnus Magnusson, p. 42. It seems most likely that the true location of the cave was lost sight of many, many years ago – possibly when the Jews were in exile, or even earlier. As far as we are concerned, the strongest evidence for this being the cave of Machpelah to us is the manner in which the whole thing came about. It was brought to Ron’s attention 14 years ago because of very strange events which were occurring on this family’s property. Ron has not actively sought to work on the site – in fact, he has been hoping to be able to finish all the overseas work soon- a new project was not in our plans. But suddenly, things fell in place. With no more “evidence” than that to go on, we proceeded, and found a cave which certainly meets every qualification required to be the cave of Machpelah, except that the “deceased” are not there. We’ll keep you posted on further developments. We were all very disappointed when we found that there were no bones in the cave, nor was there the mummy of Jacob. But we had already considered and discussed this possibility at length. In fact, we had studied this a great deal even before we began work on the cave. Let’s go back to a verse we discussed earlier. “Jesus, when he had cried again with a loud voice, yielded up the ghost. And, behold, the veil of the temple was rent in twain from the top to the bottom; and the earth did quake, and the rocks rent; And the graves were opened; and many bodies of the saints which slept arose, And came out of the graves after his resurrection, and went into the holy city, and appeared unto many.” Matthew 27:50-53 We felt it was a distinct possibility that Abraham and those buried in the cave were among those resurrected with Christ. The site of the cave is certainly within walking distance of Jerusalem as it is 19 or 20 miles away. No one could doubt that Abraham, Isaac and Jacob would certainly qualify as “saints”. Could they have been commanded to life when Christ arose? Of course, the Jewish legends are completely silent on events connected with Christ. The Bible is very clear on the fact that the priests and rulers tried to cover up the true events of Christ and His resurrection, so there would be no Jewish records of these resurrected saints. “And if Christ be not raised, your faith is vain; ye are yet in your sins. Then they also which are fallen asleep in Christ are perished.” 1 Corinthians 15:17,18 Paul made it clear that if Christ had not arisen, we would all be lost. Until then, Satan had legal claim over all those who lived on this planet, as all had sinned. Remember how he contended over the body of Moses? But, after Christ died, things changed – Satan no longer could protest that all men were his legal captive. Christ had paid the price. Between Christ’s death and His resurrection, something happened which ratified the covenant – His Blood fell on the Mercy Seat. His Father saw that the offering was perfect in every way and also that it was presented to Him in a manner that was consistent with His requirements. It was accepted! 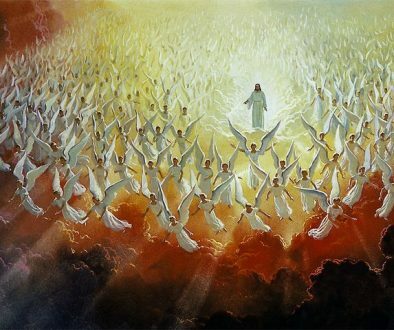 Christ was resurrected and a group of saints also came out of their graves! And although we do not know who they were, it would seem that Abraham, Isaac and Jacob would certainly be worthy candidates – these men through whom the promise was actually given – those who had participated in the blood sacrifices in faith of the coming redeemer. The absence of the bones is a very important evidence. Both the heathens and the believers of God placed a tremendous importance on the sacredness of a person’s grave. They went to great lengths to preserve all graves. It was simply taboo to disturb a grave among all peoples and beliefs. This cave was not disturbed, as far as we can tell. We cannot help but be of the thought that the discovery of the cave is associated with the Ark because of the way the cave was brought to Ron’s attention while working on the Ark – the man who told Ron about the cave is the man who entered the chamber where the Ark is back in 1982. The family wanted Ron to examine the area of the cave because of supernatural occurrences that they had seen – the “fire” which left no traces when they went to take a closer look. Strange events – yes, but we do know that the cave meets the criteria to be the authentic site. We know it contains the proper number of crypts. We know there is evidence that the cave was cracked open by an earthquake. And we know that those crypts are empty. And we will never know for sure if they were resurrected until we get to Heaven. But the subject of the resurrected saints was recorded in the Bible by Inspiration, so it is a subject worthy of our study and understanding. God is drawing attention to great Truths which have been overlooked for many years – subjects which focus on the mysteries of eternal life and the complete accuracy of His Holy Word. This text specifically refers to what Christ would accomplish on earth and where he would be buried. We have carefully and prayerfully investigated the burial place of Our Saviour. As you know, there are traditions that would have us believe that He didn’t actually die, but that He “migrated to America” and possibly other places. Even among those who do believe that Christ died and was buried, there are differing opinions as to where He died, and where He was buried. There are many burial caves and sepulchers near Jerusalem. It appears that many of the professed followers of God desired to be buried near Abraham’s resting place in Hebron, as we discussed earlier. Later, Jerusalem, the location of the first and second temples, was considered the first choice of a burial place. The statement that He (Christ) “made His grave with the wicked, and with the rich in his death”, had long puzzled me. Joseph of Arimathaea was rich, but was not wicked. And his tomb was new- what did it mean when it said He was buried with the wicked? During our last trip to the Jerusalem and Hebron areas, many questions about these things were cleared up. Also, Mark 16:4 tells that the seal stone of Christ’s tomb was not only a “very great stone” but that it had been “sealed”. In the Copper Scroll (found with the Dead Sea Scrolls) it mentions that a certain amount of silver was hidden beneath the “great seal stone” from “Zadok’s tomb”- Zadok, meaning, “The Just One”, which is Christ. There is overwhelming evidence that the Garden Tomb is Joseph of Arimathaea’s tomb and the one in which Christ rested over the Sabbath, and from which He arose, gaining the victory over the grave for us. He was buried in a rich man’s tomb, but what about His grave being “with the wicked”? Approximately 50 feet from the Garden Tomb to the left as you face the tomb, is located a large complex of tombs that belonged to wealthy Jews. One of these is hewn to the exact dimensions of the Holy and Most Holy chambers of Solomon’s temple. The royal Egyptian cubit is used (20.6 inch=cubit). There was a brass box recessed into the floor that now, we were told, has been stolen, and the chamber cut into the stone floor left behind is exactly the dimensions of the table of Shewbread (20.6 in wide by 41.2 inches long, or one cubit by two cubits!) The burial crypt in this chamber is of the size and position of the Most Holy place! This would imply that the owners and users of this tomb considered themselves equal to God. How much more wicked could one get? To be buried only a few feet from this blasphemous tomb is certainly being “with the wicked”. This complex of tombs to the northwest of Joseph’s (Christ’s) tomb were hewn into the face of the dry moat that was cut across the ridge of Mount Moriah. This was done to make the north wall of Jerusalem less vulnerable to attack. The tombs were hewn in a north-west to south-east progression. It is obvious that these were the tombs of the wealthy and priestly class. They were hewn during the first temple period and used until the Babylonian captivity. During the captivity, the portable ossuary was introduced and used, as revealed in the ancient Jewish records. These stone boxes were of a size to contain the bones of one individual and were designed to make it possible for the bones of the Jews to be transported back to Jerusalem and interred in the family tomb. The families who owned these tombs began using them upon their return from the captivity and they were used through the Persian and Greek periods. In some cases, the tomb entrances were sealed with slabs of stone bearing Greek inscriptions and some researchers present this as proof that the tombs date from the Greek period. This view fails to take into consideration that such a tomb, and such a choice location was a matter of pride for the family, and they, of course, would have their inscriptions updated to the most popular and widest read language as newer members would die and be interred there. The Garden Tomb is located in the next available position, immediately southeast of these first temple period tomb complexes. There would be no need for the old, rich and priestly families to hew other tombs. No Jew wished to be buried anywhere but in their ancestors’ tomb. Foreign kings had their tombs hewn near the highest points around the city; as higher indicated greater importance. The Garden Tomb location is the obvious first choice for the burial of “the new-rich” of Christ’s time. And Joseph of Arimathaea was just such a person. Bible scholars and believers have no doubt that he had his tomb hewn by Divine Providence just at the right time to allow for the fulfillment of the Isaiah prophecy about Christ’s burial. In 1985 a six-inch hole was drilled into the side of the ark. By way of that hole, matrix material samples were taken from within a cavity. Careful examination of the samples with the naked eye revealed fibers that appeared to be hair. Recently these fibers were evaluated by a fiber expert in one of the nations leading crime labs. Under microscopic evaluation using both white and crossed polars light, the fibers revealed all of the features characteristic of mammal hair. Further, the hair was determined to be that of an animal as was clearly indicated by a unicellular medulla (center cell structure). “Color banding” was also noted. “Color banding” is the change in color of the hair from one end to the other; not uncommon to the mammal fur hair of the Felidae (cat) family. Only a portion of the hair root remained, however, the fibrous appearance of the remaining root is indicative of the Felidae hair. Other fibers from the matrix material were also evaluated. One of the samples proved to be some sort of plant fiber as the cellular structure was plainly visible. Another hairlike fiber was evaluated which revealed very unusual characteristics: the shaft of the fiber was long and cylindrical like hair, but revealed none of the other characteristics commonly associated with hair. Along the outer surface of the fiber, angular spines extended from the shaft. The specialists believed this to be some sort of plant fiber but all agreed that they had never seen anything like it. And finally, one of the fibers taken from the matrix had neither animal nor plant characteristics. The specialists agreed that if this fiber had been collected as modern day evidence, there would be no hesitation in declaring it man-made! The samples are in the process of being photographed under microscopic enlargement so that this documentation can be shared with other experts around the world. Hopefully, additional conclusions can be reached as to the nature of the unusual specimens that have not been positively identified. Testing has been scheduled for choice hair samples which are still in the matrix material and with a visible root still intact. There is a remote possibility that DNA information may be present and can be obtained from the remaining root. Future plans call for carefully proceeding with scientific evaluation using state-of-the-art technology. In the mean time, we can humorously conclude that animals were definitely on board Noah’s Ark!